I posted a sound-bite from my recent fieldwork in Myanmar on Allegra this week. 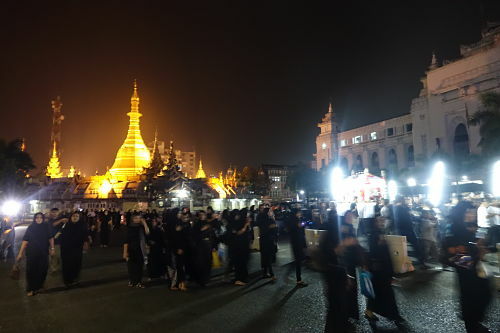 On December 2nd 2015, the Shia community in Myanmar celebrated Arba’een – the fourtieth day after Ashura. I recorded this martyr song around midnight in Myanmar’s former capital Yangon where I have been carrying out 12 months of ethnographic fieldwork between 2013 and 2016. That night, men and women joined a downtown procession of a tomb replica of Imam Hussain, the grandson of Mohammad. The Arba’een celebration is one of the largest Muslim celebrations worldwide, attracting around 25 million people in Karbala (Iraq) in 2015 alone. In Yangon, however, the Shia community is very small. There are no official numbers; community leaders usually count the attendance at Ashura and Arba’een, the two most important memorial events of Shia. 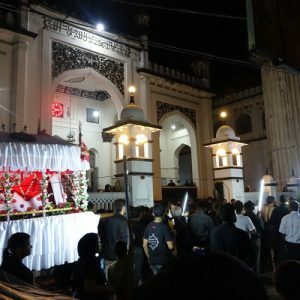 “We might be around 6000 in Myanmar,” one elder said, “but in Yangon, maybe around 3000 only.” During the yearly mourning period, which lasts for two months, the community gathers regularly in their two mosques in the downtown area. Women and men as well as various youth organizations have their own duties to perform and they organize seperate festive events. In 2015 and 2016, every week another donor came forward to pay for food to be prepared in the mosque on Fridays after juma, the weekly prayer meeting. 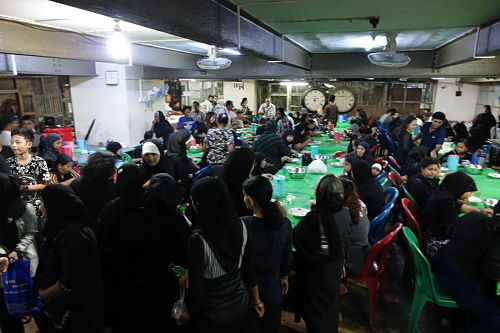 The cooks, who are employed by the board of trustees of the mosque, prepared rice and chicken dishes for everyone and people took turns eating, making sure they finished their plate quickly to make space for new guests. Next to community members, also Buddhist monks, neighbours of various religious backgrounds, Sunni friends and the occasional tourists, who happened to pass by, were invited. Afterwards, milk tea was being served outside and people hung out to chat with each other. The Shia community in Myanmar traces its origin back to either Iran or to India. Community members are well aware of each others genealogical backgrounds and frequently point to differences in their physical appearance to indicate the geographial origin of their great-grandparents who all had been brought from India to Burma (as the country was called until 1989). From 1840 onwards, the British colonizers had shipped thousands of “Indians” across the Bay of Bengal to help them in the administration of their final addition to the British Empire. Muslims from India had been under colonial governance already, they often spoke English well and knew how to interact with the British authorities. Rangoon, as the small town by the Andaman sea was called back then, quickly turned into an “Indian city” and was composed of people referred to as kula lu-myo in the Burmese language, literally “people who have crossed over” (meaning journeyed from India to Burma across the Bay of Bengal). Members of the Shia community applied for a free land grant from the East India Company, an English, later British trade company that operated in India and Burma from the mid-18th century onwards. Their request was granted and two mosques were erected, both in the downtown area. Next to the two Shia mosques, Sunni mosques, Hindu temples and Christian churches were established in this period, turning Yangon into a multireligious place. Although Myanmar is a de facto Buddhist state in which the majority of its population practices Theravada Buddhism, Yangon has retained its plural religious landscape until today. This entry was posted in Allgemein on 21. August 2016 by Judith Beyer.